What issues would Frances Perkins be tackling today? I’ll lead off with this stunning chart from Matthew Iglesias’s blog on ThinkProgress. Note that red line. You see a lot of different things happening here. One is poverty among seniors declining thanks to Great Society expansion of retirement support programs. The other is a jump in poverty for non-seniors during the 1978-82 period that persisted throughout the Reagan-Bush years. This was in part driven by an increase in the proportion of female-headed households without husbands, but the same pattern appears within that subset. We then had a giant reduction in poverty among this group in the 1990s which was a combination of strong economic performance, “welfare reform,” and also the fact that the Clinton administration really wanted to make welfare reform work so threw lots of stuff—EITC expansion, SCHIP, etc.—at making it work. Then we saw a slow, steady erosion of that progress. How did Germany become such a great place to work in the first place? The Allies did it. This whole European model came, to some extent, from the New Deal. Our real history and tradition is what we created in Europe. Occupying Germany after WWII, the 1945 European constitutions, the UN Charter of Human Rights all came from Eleanor Roosevelt and the New Dealers. All of it got worked into the constitutions of Europe and helped shape their social democracies. It came from us. The papal encyclicals on labor, it came from the Americans. As the Salon introduction notes, in Germany “they have six weeks of federally mandated vacation, free university tuition, nursing care, and childcare.” And, while a six week vacation would surely be welcomed by single mothers and their families, it’s the last three items that really make the difference. Affordable higher education, accessible preventive health care, and affordable quality childcare — those are the big pieces missing in the United States today. And without them, single mothers face a very difficult uphill battle. While Geoghegan credits Eleanor Roosevelt, certainly Frances Perkins was right in there, also. We know that Perkins was engaged in the drafting and dissemination of FDR’s Second Bill of Rights. And what a different society we would be living in today if that agenda had been carried forward in the U.S. as it was in Germany and the other countries of the E.U. 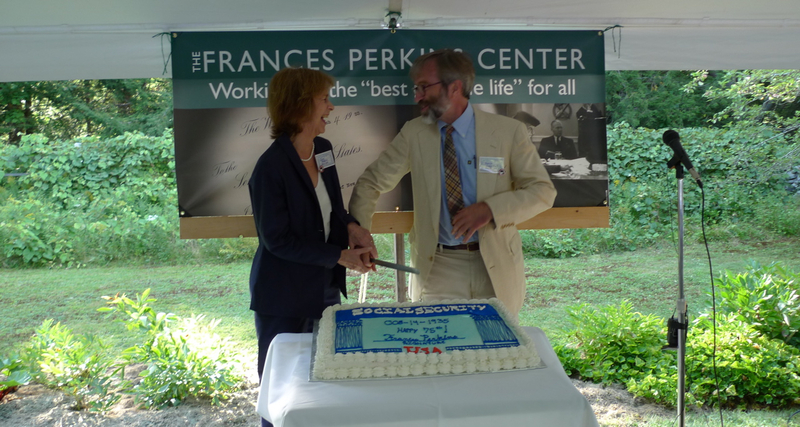 We often ask ourselves, “What would Frances Perkins do?” as we watch the news from Washington. Here are two stories that bring up that question. You can easily guess what her response to each would be. It’s not a sweeping proposal on the scale of the WPA, but it’s a move in the right direction. the Deficit Commission is finalizing a deal that would increase Social Security benefits slightly for low-income recipients while cutting them for everyone else. The Commissioners apparently believe that putting this “progressive” gloss on a package of unneeded cuts would allow them to move forward with their predetermined anti-Social Security agenda. This new proposal would pit middle-class seniors against the elderly poor, forcing them to compete for a stripped-down pool of dollars. The end result would be the one that many Commission members have pursued for years: to cut the most stable and successful program in the Federal government’s history. First and foremost: Social Security and the deficit don’t belong in the same sentence. The fact that this group is fiddling with Social Security is a travesty. Social Security BY LAW cannot run a deficit; therefore, it can’t contribute to the federal deficit. Second: How does the president’s commission get off tinkering in secret with a program that touches every single working person in the United States? Any proposals changing the way Social Security is run should be made in the blazing sunlight. Its millions of participants need to know what is going on. In fact, we know how voters feel about Social Security — they don’t want to cut it. Eskow quotes some recent poll results. Third: Social Security’s financial condition is monitored very closely. Every year, the trustees issue a report on its health. This year, the trustees stated that the system could pay full benefits for the next quarter century or so with no changes to the current system. 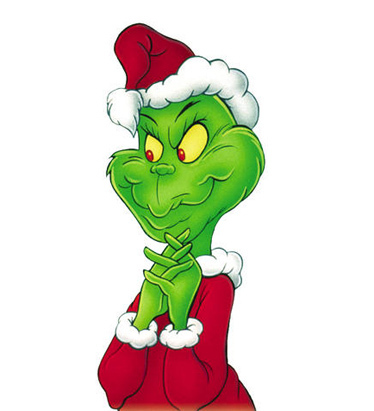 There is no need to panic; there’s plenty of time to act prudently and cautiously. In addition, if new revenue is desired, the easiest change would be to lift the cap on contributions. Right now, if you make more than $106,800, you don’t pay Social Security tax on that additional income. Lifting the cap would be easy from an administrative standpoint and would provide enough income to take us well beyond the next quarter century. If this were a public debate and not a secret one, this latest move could be used to start the debate we should be having: Why don’t we strengthen and increase Social Security, rather than cut it? We had two New Deal grandchildren on hand to cut the cake. 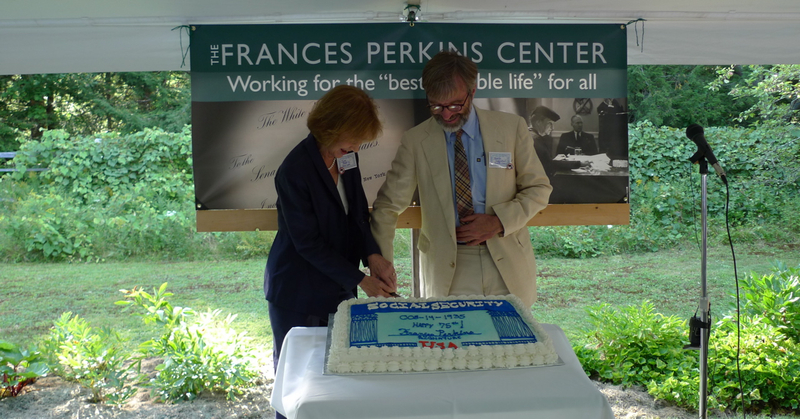 Professor June Hopkins is the granddaughter of Harry Hopkins and Tomlin Perkins Coggeshall is Frances Perkins grandson. 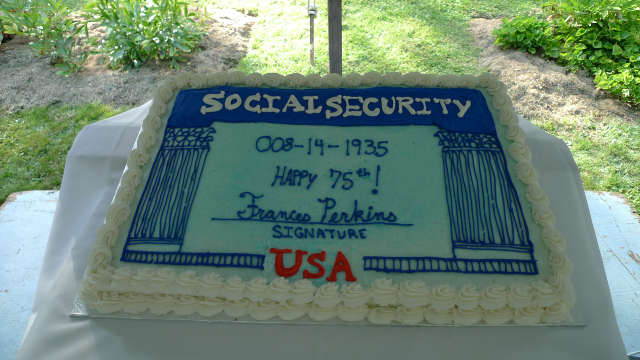 Perkins was the chair and Hopkins was a member of the Committee on Economic Security, which created the Social Security Act.